Barbara Construction’s Janice Stiller shares about the new Four Directions building. Southcentral Foundation continues to listen to the voice of the customer with the recent expansion of the Four Directions Outpatient Treatment Center. In 2011, when Dena A Coy Outpatient was changed to Four Directions Outpatient Treatment Center, the program expanded from a census of 30 to 60 and began serving both men and women. By 2013, the program had a long waitlist. With increasing demand continuing between 2013 and 2017, SCF leadership identified the need for a bigger space. As a result, the old blood bank building was purchased and in December 2017; a remodel was completed which expanded from 12,000 square feet to over 13,000 square feet — more than doubling the size of the program space. 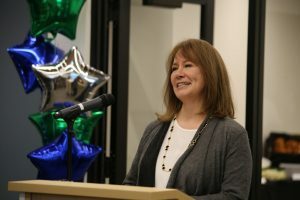 At the opening ceremony, Deanna Wlad of Spark Design described how the design of the building was meant to provide a welcoming environment that represents wellness. “Some of the design features that we incorporated into this building were to promote wellness, and that involves natural light which is critical in our environment. We designed finishes that are warm and natural, something like the wood that you see on the ceiling and something as simple as the carpet selection. The patterns that are organic and the colors that are natural should all speak to who you are and the program and the people that you reach out to,” said Wlad. “I want to thank the Alaska Native community who has voice and who tells us that we need to focus on addiction. We hear that in our health advisory committees, we hear that in our gatherings … your voice is heard and we’re listening,” said SCF Vice President of Behavioral Services Division April Kyle. Services offered at Four Directions include relapse prevention, early recovery, domestic violence, family education, addiction services, and more. Services are offered for both men and women age 18 and older. On average, 6 to 16 hours a week of group and individual sessions are completed by individuals at the beginning of the program. The amount of time in the program decreases as stability is achieved.